Eastern Pennsylvania Youth Soccer will celebrate the 2018 year in soccer at the Annual Awards Banquet on Friday, February 22, 2019. In anticipation of the event, which will take place at the Sheraton Valley Forge, we'll profile honorees each day leading into the Awards Banquet. 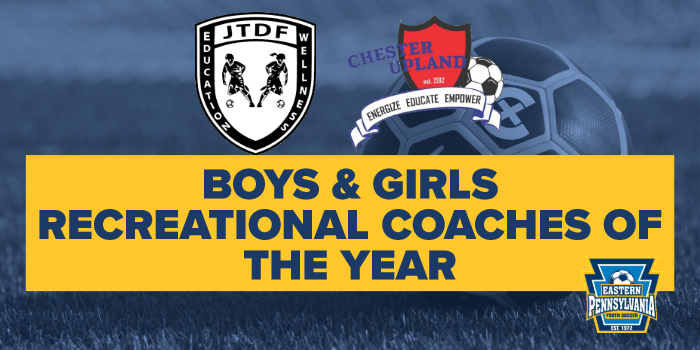 Today: Boys Recreational Coach of the Year Brendan Grady and Girls Recreational Coach of the Year Leigh Craig. A standout player at Swarthmore College and, before that, with Cal-North ODP, Brendan has since turned his attention to coaching. 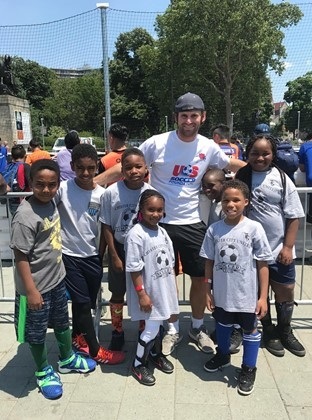 Along with Brent Jacquette, Brendan co-founded Chester Upland Youth Soccer in 2012 as part of the U.S. Soccer Foundations' Soccer for Success program, which promotes healthy lifestyles through soccer. In 2018, the players at Chester Upland Youth Soccer competed in the club's fifth annual play day and the end of the Soccer for Success Festival against teams from Camden, Pottstown, Kensington and Coatesville. Brendan also helped bring middle school soccer to the Chester-Upland School District in 2017, where many CUYS players play. For more information on Chester Upland Youth Soccer, visit chesteruplandyouthsoccer.org. For more information on Chester Upland Youth Soccer, visit their Facebook page here.